I like listening to others and understanding their businesses and the challenges they face. If I have something specific I want to talk about, I have found the process of getting clear about what my challenge is, so that I can describe it to you as clearly as possible without rambling, is usually enough for me to then figure out my own answer, but I enjoy sharing my challenge with you, my deduction and the solution. The drop-in calls are a great way to touch base with you and the group and hear the news. It’s speaking out the worries or doubts, realising that once out they are no longer worries. A problem shared is a problem halved. It’s like having someone in the background cheering you on, it makes the whole business side less scary and more fun. I feel I can do this, step by little step, and I know it will be OK. Accountability beginning with myself. Having in the back of my mind that I will need to report on my progress and not just dilly-dally and faff about. Learning from other’s difficulties, hearing what they go through, listening to the calls not only makes me realise what I’m going through is normal and that I’m not alone, but also provides solutions for how to deal with situations. I enjoy the availability and timing of the calls. 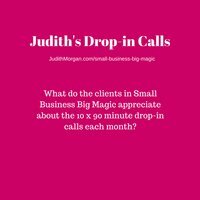 This extremely focused and helpful time on a regular basis, and the accountability that comes with it, helps me to return to improving my business and life again and again, even in times when I don’t think I have time. I enjoy the calls and get a lot of benefit out of running ideas past you and gaining advice on how to move these forward. The many opportunities for a live chat. The recordings – always a good listen, just to hear your advice to others even when there’s no relevance to my situation. I enjoy hearing how others are doing. I need the accountability of checking in so I stick with my routine on a regular weekly basis and keep my focus; I like having someone to spur me on when inspiration isn’t coming or when I feel like giving up. Regular calls mean I can easily access help from you within a short amount of time. I can commit to achieving something or doing a task, with the accountability of you and the group. I can listen to calls I have or have not attended. I ALWAYS learn something, even though our businesses are very different. These drop-in calls are run to a regular schedule which allows plenty of time for everyone to get their own individual needs met and questions answered, and the schedule is designed to suit all global time zones. If this sounds like something which could benefit your business, then contact me and let’s discuss if it would be magical for you too.